Stanczyk, like most family historians is proud of his heritage and research. Today’s pics are just a small part. The two pics represents two wings of this jester’s family tree. This jester does not employ genetic testing for a variety of business/legal reasons. 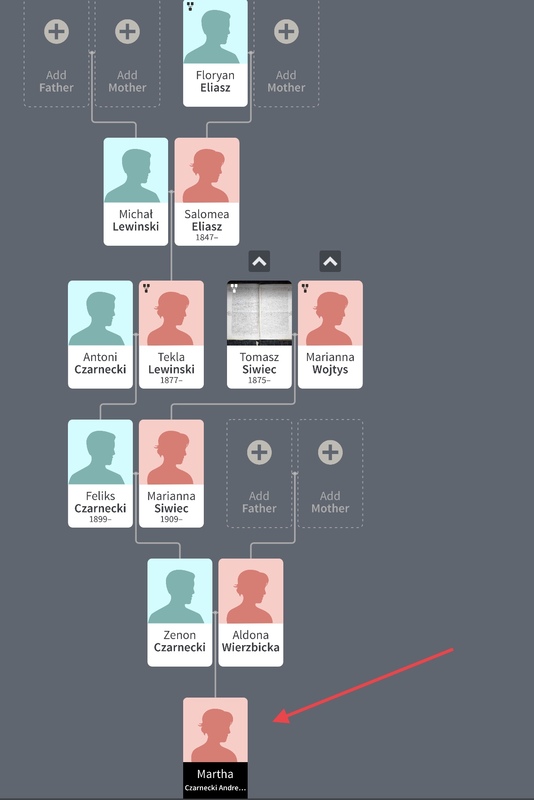 However, now twice genetic genealogists have used my tree to solve their genetic mysteries. 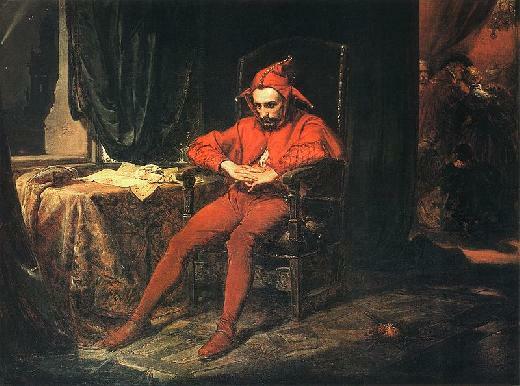 Now this jester has maintained that the people (osob) of Biechow, Pacanow, Zborowek, Szczebrzusz, Olesnica, Stopnica, Beszowa, Swiniary, Solec(-Zdroj), and Dobrowoda parishes (parafia) including their surrounding villages are inter-related. So I have been only too happy to work with other genealogists. Genealogy is easily the best suited field of study for crowd-source solutions and collaborating on family tree & histories. My feeling is that I am helping others who are connected to me and through our mutual research we will discover those connections. Indeed that is the raison d’etre of this blog. Its meant to be a cousin magnet. I have benefited as much as the other genealogists. Sometimes I get pictures of distant cousins, sometimes pictures of myself or my father or grandmother that I did not know existed (and obviously did not have). Often I get get new avenues of research in branches that were long lost. Back to the pictures. John Marzic (right pic) is a person from an affiliated family of an affiliated family (Zasucha). I worked with a genetic genealogist, Kathy G. and we found her cousin’s cousin who was adopted as child and we found his birth family. John Marzic turned out to be the missing father and through extensive testing of many people not shown, the genetics provided the info to connected John Marzic to myself. 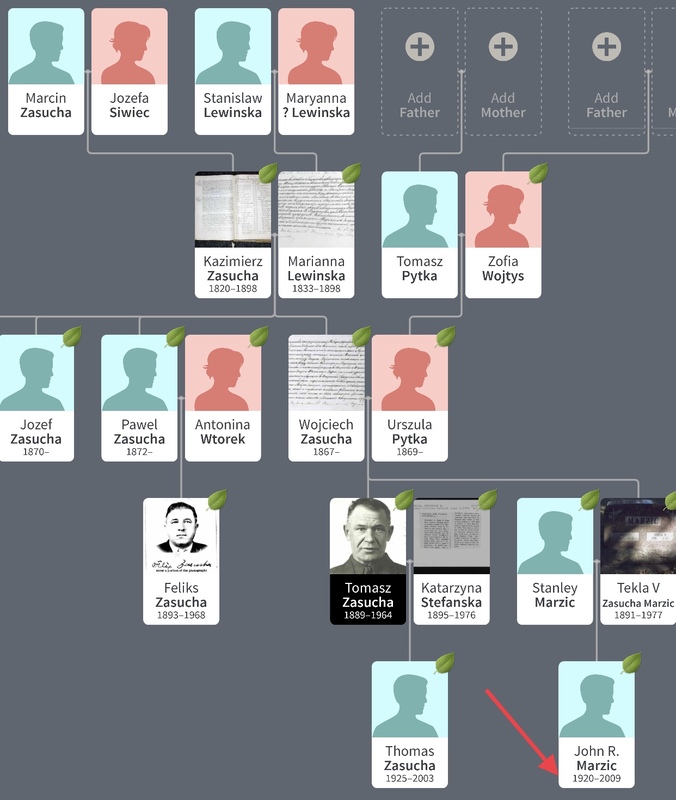 I did not even know John’s son’s name, just that he grew up Michigan and was connected to Pacanow (my grandfather’s birth village) and might be related to a Zasucha. Remember a blog “Searchin’ For Zasucha”? It and a few other Zasucha blogs drew Kathy’s attention. We worked together, me using geneteka and genbaza and aiding on the USA side in odd bits here and there. Kathy did the suspected families (from Pacanow to Niagara Falls(NY) to Albion(MI) to Nevada). She did the genetic testing of the probable branches and we succeeded. I did NOT know her “cousin’s cousin, the adoptee”! The left picture shows a FB genealogist who worked with me to connect our trees! Martha had so many wide branches I had no idea of. Through her I even found Eliasz that I did not know of connected to her ancestors (through marriage). We did connect our trees. I like to add the branches leading to the genealogists connected to me. So I was surprised when Martha messaged me recently about a SF person who was highly connected to her genetically (long cm strands and many strands). Martha started describing to me and I knew at once she was connected to my Marzic/Zasucha branch (so yet another path to Martha and me). They are at far branches and yet they are connected via genetics. But it was my branches (and I suppose my untested genetics too) that connected them. Through her MRCA numbers from her to him & vice versa (slightly different 3.4 generations & 3.6 generations), I was able to count up my tree from her and from him and tell her the most likely branches she needed to pursue. In her case it was her Lewinski branches & Wojtys branches (oddly enough not the Eliasz nor the Zasucha). Counting back from John Marzic (or really his son) I ended up at Lewinski & Wojtys the same as for her. The Eliasz & Zasucha are merely stepping stones between these two families. Kathy G, if you are still reading my blog, then look at Martha (left pic with arrow). Her DNA is up on some genealogy website(s). Your cousin’s cousin has another set of family branches to add to his tree. By the way, Martha & Kathy, I have a friend, Louis Kessler who is a genealogist, blogger, & a programmer who does genetic genealogy. He has some excellent dna triangulation software on his website.